1. Cut 2 aubergines into 2cm wedges, and cut 1 onion into thin wedges. Spray all over or lightly brush with about 2 tbsp olive oil. 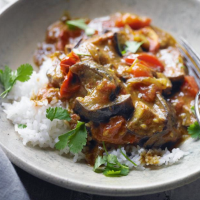 Heat a deep frying pan over a medium heat, then add the aubergine mixture and cook for 10 minutes stirring until starting to soften. 2. Add 1–2 tbsp Bart Veeraswamy Gujarat Masala Curry Paste, turning the vegetables to coat in the sauce. 3. Take 300g pack of Waitrose Red Choice Tomatoes, chop and add to the pan along with 100ml water. Season, cover and cook for 15 minutes, stirring occasionally, until the vegetables are tender and the tomatoes pulpy.